Your destination for the Habs! It was announced earlier today that Montreal Canadiens prospects Zachary Fucale and Charles Hudon were among the 25 players invited to Canada’s National Junior Camp that will begin on December 12th, 2013 in Etobicoke, Ontario. Fucale and Jake Paterson of the OHL’s Saginaw Spirit were the only two goalies invited to the camp whereas Team Canada invited eight defensemen and fifteen forwards. 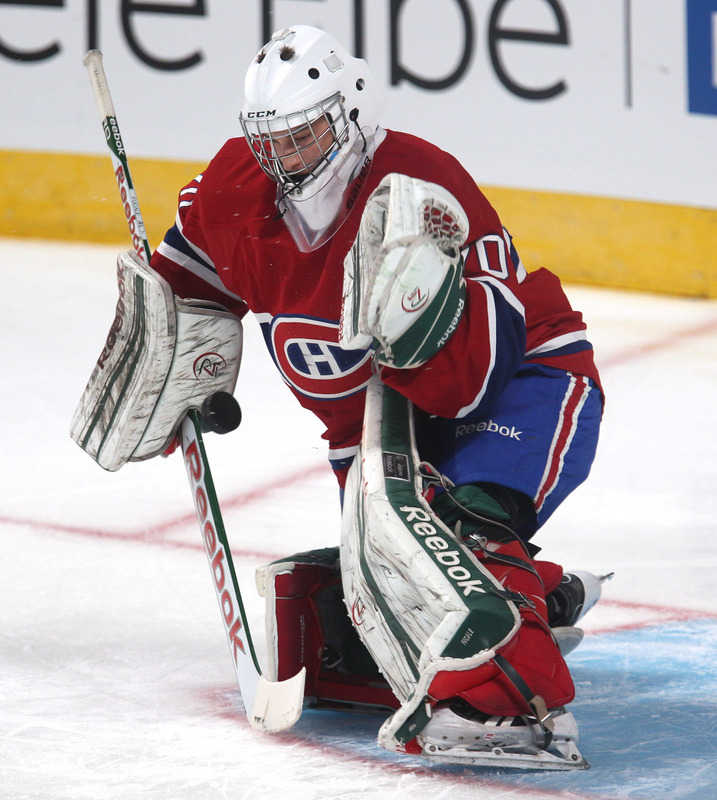 Fucale, who was drafted 36th overall by Montreal in 2013, is the most decorated goalie in Canadian junior hockey. The 18-year-old netminder he has already put a QMJHL championship, a Memorial Cup and a gold medal for Canada at the Ivan Hlinka Memorial world under-18 tournament on his hockey resume. Fucale posted tremendous numbers last season with the powerful Halifax Mooseheads, finishing with a stellar 45-5-3 record to go along with 2.35 GAA and a .909 save percentage. This season, Fucale is 17-7 with a 2.62 GAA and a .899 save percentage in 25 games even tough the team has lost several marquee players such as Nathan MacKinnon, Stefan Fournier (now with the Hamilton Bulldogs), Martin Frk and Konrad Abeltshauser. As for Charles Hudon, he will take part into his second Team Canada training camp after being invited last year, but missed the tournament due to a severe back injury. The 19-year-old winger is having a solid campaign so far, notching 11 goals and 21 assists for 32 points in 29 games with the Chicoutimi Sagueneens of the QMJHL. The diminutive winger played 9 games last season in the AHL with the Hamilton Bulldogs, scoring 1 goal and 2 assists for 3 points. Four other players from the Courteau Circuit have been invited to camp including Jonathan Drouin (Halifax), Félix Girard (Baie-Comeau), Frédérik Gauthier (Rimouski) as well as the top-point getter this season Anthony Mantha (Val-d’Or). Check Nate Seager’s breakdown of the 25 players invited to get a better idea of Team Canada’s possible line-up. Which Montreal Canadiens Will We See This Week? Heavy influx of Quebecois players looking to crack Team Canada, including couple of Habs prospects. Thanks for your comment and your link. That’s a great news for the QMJHL indeed.